New York : Nan A. Talese, Anchor Books, 1996, c1995. A great short read about early Irish history if one discounts the author's paranoid view of seeing the fall of Rome as a template for the impending demise of the United States of America, crushed by Mexican and Haitian "hordes". While the US will certainly become a less white country, immigration was and will never be the trigger of doom in this still largely empty country. It is truly strange that a descendant of the malnourished and poor Irish immigrants wants to shut the door to people in need. Although not helping "the least among you" fits the world view of US Christian Conservatives. Besides his conservative Catholicism, it is the author's dirty old man perspective that imbues the book with a pungent yet funny flavor. The heathen Irish had very catholic sexual mores. The unstoppable Irish libido later on shocked the English puritans. Too many pages of this rather short book are devoted to the fall of Rome, in which the author partly misinforms his readers. He largely follows the outdated Gibbonian Christian degeneration argument for the fall of Rome, using the prissy Saint Augustine as his key witness. This allows him to present the vibrant heathen Irish in the best of light (I have to learn more about the old Irish sagas) and turn Saint Patrick into a true hero. In an otherwise good account of the Irish saint's life, I wish he had included more information what made the Irish chieftain kings accept Christianity. The sudden spectacular conversion of most of the island remains a mystery to me. The author also fails to develop the economic successes of the Irish monasteries. After the destruction of the Roman large estates, it was the autonomous Irish monasteries that established engines of economic growth in the wilderness. This model was developed in Ireland where civilization and trade were notable by their absence. A fortunate side effect was the creation of scriptoria that preserved many Latin texts. The author's titular claim that the Irish saved civilization, however, is totally wrong. Firstly, can anybody today still limit the use of civilization to Western civilization? Secondly, there was the Rome that never fell, Constantinople as well as Alexandria. Many of the Latin authors also survived either via Greek or Arabian scribes. The Irish monks managed to re-establish pockets of civilization, often in remote spaces. It took others to recognize the value of what they had saved. Petrarca and the early humanists rediscovered the ancient manuscripts rotting away in the monastery libraries. I do get why this book on "How the Irish Saved Civilization" was a bestseller. Not only is it the perfect gift for St Patrick's Day, it is entertaining and readable. But I also found it superficial and not reliable. It may be the contrast with some really fine histories and biographies I've read lately, but several things in this book made it suspect to me. Cahill isn't a historian. The short biography at the end says only that he has a MFA in "Film and Dramatic Literature" and that he has studied theology. His pro-Catholic bias is notable throughout. (He even takes gratuitous slams at Mormons and Jehovah's Witnesses.) I don't claim a writer of a solid history has to be a historian--some of those great histories and biographies recently read were by journalists. And all writers have their take, from conservative to Marxist, that are evident to me. But notably, the good ones, whatever their background or worldview, have pages of sources and notes to back up their claims--this didn't. This is an entertaining and informative book, and the audiobook is winsome and sparkling, courtesy of 'performer' (not credited merely as 'narrator') Donal Donnelly. The personality of the subjects is amply shown by the texts quoted, and the story is interesting and definitely underknown, if not unknown. What really gives me pause is the suffusion of Cahill's own biases in the text. This isn't a scholarly work, but even for a popular history, the degree to which Cahill's opinions and judgments color the narrative gives me pause and makes me trust his version of history slightly less. Oozing affection for things and people Irish is appropriate to the work, and I'm with him on his nostalgia for the Celtic Church, if only from descriptions in Brother Cadfael books. But in general, the Occidocentric (saved Civilization did we, or just one?) and Christianocentric biases seemed a little strong. Plus, he totally buys into monkish anti-Viking propaganda. Very revealing on a personal level. I discovered a good deal of my "irishness" in the descriptions of the people. Made me rather proud of the tenacity of the monastaries in preserving early writings. That may be why I love books! This weekend I finally got around to reading How the Irish Saved Civilization, by Thomas Cahill. This book, originally published in 1995, is the first in a series by Cahill called Hinges of History, books that examine "turning point" events in history. This book tells the story of how Irish monks and scribes "saved civilization" by preserving Western literature during the Dark Ages after the fall of the Roman empire (5th century) and before the rise of Charlemagne in France (8th century). Cahill depicts a lively and detailed picture of the fall of Rome in the hands of the Barbarians and then proceeds to paint with loving, vivid colours the person who made it all possible: Patrick, the man who almost single-handedly "created" Ireland. An amazing telling of the spiriting away of religious and philisophical texts to the monestaries of Ireland. This was an overly-short, extremely lacking handling of an interesting and rich topic. Half of the book was an unnecessary love letter to the Classics, the rest was a superficial and dry survey. The history of Irish monasticism and the preservation of European culture during the Dark Ages deserves a far superior treatment. 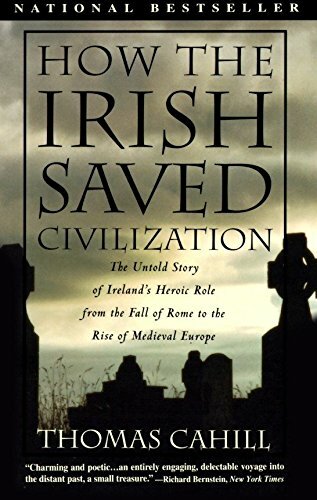 I really wanted to like this book, but ultimately I was unimpressed with Cahill's argument that "the Irish saved civilization". He almost gets there, and maybe he would have if he had dedicated a hundred pages or more to this overall short book, but he keeps it brief and spends a lot of his space on making a poor case for how civilization ended. Cahill's argument on Rome's fall is quite short and a little disappointing since he brushes aside a lot of the existing scholarship that has gone into this question. He eventually settles on greed and loose morals and then poses that the values of early Christianity pulled the tatters together. Cahill also makes an argument for early Irish peoples having a certain cultural attitude that lends itself to Christian enlightenment. Thus Ireland was a prime place for the remnants of book learned Christian monks to settle and keep the flame alive until they were strong enough to reseed England and the rest of Europe with the Greek/Roman/Christian heritage. The big question left over is exactly what does Cahill mean by "civilization"? If he means a certain Roman Christianity version of Greek enlightenment, then yes, he might have a good argument here. But if he simply means "civilization" as in cities, with trade, philosophy, religion, agriculture, ect. then we have a bit of a problem. Were there any other places that were committed to retaining and preserving knowledge during this time? Why yes, there were. Byzantium was still going strong, as was Baghdad. In fact, the Islamic tradition was also doing basically the same thing as Cahill says the Irish monks were doing, copying and studying Greek and Roman classics. In fact, the Islamic scholars made many advancements in mathematics and medicine during this time. And if we want to extend "civilization" to include the east, then we can't forget China and South Asia too. A most enjoyable narrative of how the Irish kept literacy in the world after the fall of the Roman Empire in the Fifth Century. Ireland, unlike England, had no Roman past as it was isolated on the very edge of the known world. Saints Patrick and Colomba were both part of the monastic movement who led Irish monks to found monasteries not only in the British Isles but also on the European continent. A quick, insightful read. This book was one of the texts used in a class I took focused on Irish history, and I have loved it ever since. The thing that has always struck me is that even though the Irish were so separated from the rest of the world, they still managed to save so much of it. An excellent read, very interesting, and entertaining too. The author presents a fresh and sometimes astonishing version of history, and one that makes perfect sense. His version/ translation of St Patrick's Breastplate is very moving. Entertaining, but should be supplemented w/ other histories on this period. Cahill may oversimplify many facets and facts of late Roman culture and the rise of Irish culture in the west, but I read this as a general introduction to Irish history. If one expects more, then one will be disappointed. The case for the differences between the Roman way of "doing church" and the "monastic way of doing church" is a great study in comparisons (quotes are mine, not Cahill's!). And if one is bothered by the over religious nature of this discussion, one must understand that there was no alternative to the evolution of history during this time. Cahill does show how monastic culture (from Patrick through Columcille) preserved much if not the majority of literature, both secular and sacred). Apparently the Irish enjoyed copying everything! But even more than this, there was and is an attitude within the Celtic mindside that functionality through relationships is much more important and emphasized than orthodoxy through tradition. Dense but entertaining. With a much needed pronunciation guide. Excellent review of Ireland's contribution to Western Civilization! It took a while for the author to get to Ireland and the Irish, chapter 3 to be precise. (page 71) While the backdrop about Rome and books and literacy was interesting, there were points I was thinking in a Monty Python voice, "Get on with it." Unfortunately, for me at least, the book seemed to have waves of this throughout it. Something very interesting and fascinating would be told. I would be enthralled, happily turning the pages to discover more. Then it would dissolve into a slower pace and seem to drag along, and I was reading just because of will. Then the book would pick up again. There are certain parts that stuck out and I would happily read again. There are other parts I would gladly skip over.